You had your Childhood - Now Get It Back! Chicago Triple Threat Issue! It is 1929 and Issue 29, as we head North for the annual giant toy and playset gala at Chicago's Old Toy Soldier show. 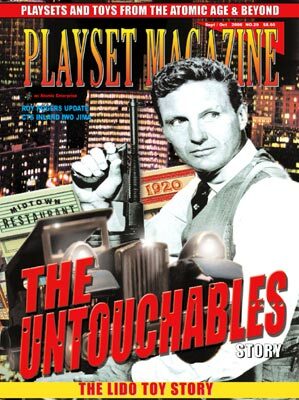 No, that review isn't in this issue, but we commemmorate the dates with a rousing examination of The Untouchables playset by Marx! With its unique and colorful streetfront representing a gangster-ridden section of the city, it's forboding West Side Warehouse and some really great figures, The Untouchables is one of Marx' greatest playsets and easily high on the Top 10 lists of many collectors. You'll also enjoy some great Untouchables- related toys. We finally get a glimpse behind one of the most prolific toy makers of the century as we offer a ground-breaking report on The Lido Toys Story as well, with Kent Sprecher's unequaled access to Lido founders, and family, plus never before published photos. The Review section delivers a whopper with CTS' new Iwo Jima, replete with exciting new terrain, and lots and lots of toy soldier news, finds, and more this issue. And don't forget to register your opinion of "The Greatest Playset"! Was it Ben-Hur, Fort Apache, maybe The Untouchables or even the Battlegrounds? You tell us! You can use the links on the home page of this website, and write as much or as little as you like. We're hoping to publish the opinions in our forthcoming gala Christmas issue!